Partial Eruption – This happens when the wisdom tooth does not erupt completely because there is not enough space to grow and so it gets stuck underneath the gums. Sometimes food particles can collect underneath the gums and start to rot the tooth. Bacteria can also gather underneath the gums and may cause infection which may lead to swelling and limited mouth opening. 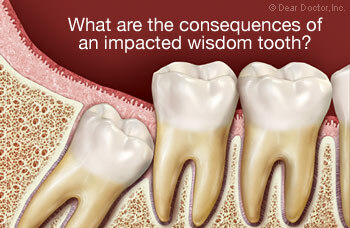 Impacted Wisdom Teeth – When a wisdom tooth does not erupt in the mouth and is stuck in the jaw bone. A cyst can also develop in some cases. Crooked Growth – In some cases, wisdom teeth can erupt in an angle, which may cause irritation to the gums or cheeks or start the decay in the neighbouring tooth. You can set an appointment with us for wisdom teeth removal in Melbourne . If your wisdom tooth is partially erupted or crooked, it is very important that you maintain the highest levels of oral hygiene. It may be difficult to eat sometimes because of the nature and placement of a wisdom tooth, which may cause decay in the wisdom tooth or neighbouring tooth. 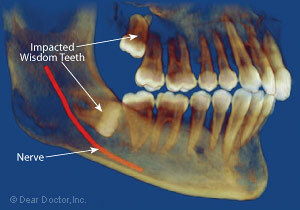 Once wisdom teeth erupt, they can cause crowding in the mouth and rotate of the teeth in front of them. Your dentist will perform oral surgery under sedation for wisdom teeth removal in Melbourne and to correct related problems. He or she will carefully remove the gum tissue covering the wisdom tooth and extract the tooth in a painless manner. Once the tooth is extracted, the gum is sewn up. Bleeding, swelling, pain, numbness is some of the side affects you might face after surgery.